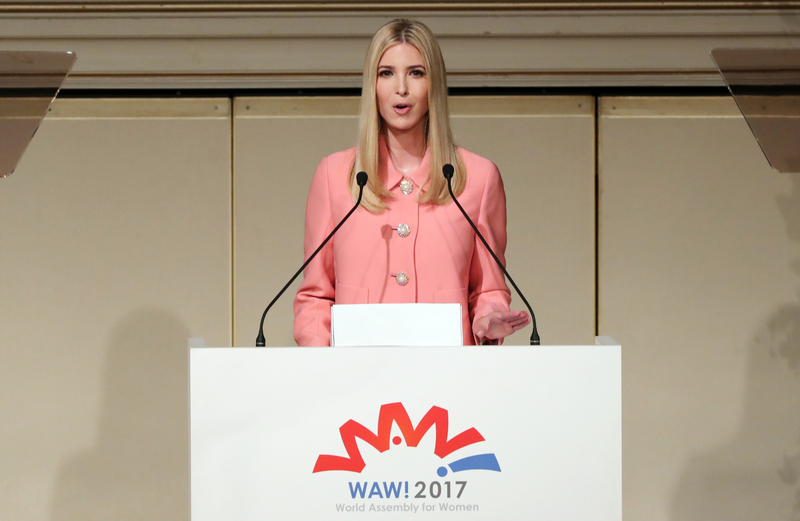 It’s hard to decide who should be more embarrassed by Ivanka Trump presiding over Tokyo’s annual “womenomics” event: Shinzo Abe or my fellow Americans. 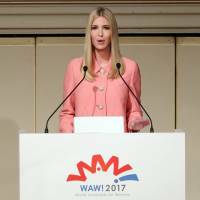 The first daughter made cognitive dissonance great again on Nov. 3, keeping a straight face as she said “all too often, our workplace culture fails to treat women with appropriate respect” and “harassment can never be tolerated.” She’s part of a White House, mind you, claiming Harvey Weinstein’s accusers are brave truth tellers, but Donald Trump’s are scheming liars. This epic transference is an apt metaphor for why Abe’s womenomics is flopping: all photo ops, no substance. A day before Prime Minister Abe and Ivanka mugged for the cameras, the World Economic Forum once again downgraded Japan’s gender-equality ranking. On Abe’s watch, Japan has gone from 98th place to 114th. It now lags Guinea, Nepal and Guatemala, sits 14 rungs below India and 104 behind the Philippines. But this presents a teachable moment for the rest of Asia, one pivotal to the region’s economic outlook. Japan’s blackeye is especially pronounced because it’s a Group of Seven nation. Abe talk of making the other half of his population “shine” is belied by policies that treat the symptoms of gender troubles, not the problem. He asks companies to hire and promote more women and diversify boardrooms, but avoids mandates to give those requests teeth. Women entering the market are too often relegated to non-regular work with less pay, fewer benefits and zero bargaining power. Under Abe, increased female participation may be depressing national wages. The dearth of gender-equality audacity in Tokyo is a microcosm of trends across Asia. Generally speaking, the past 12 months mark a period globally that women might want to forget. Accusations against Hollywood magnate Weinstein, Trump and myriad other powerful men aside, this is the first year since WEF began its annual naming-and-shaming exercise in 2006 that women’s progress slipped globally. And Asia faired especially poorly. India, for example, plunged 21 spots to 108th, a harsh reality check on the hype surrounding Prime Minister Narendra Modi’s reform program. In fact, New Delhi is now 10 dismal spots lower than in 2006. China fell only slightly to 100th place, but this is the ninth year of backsliding for Asia’s biggest economy. Could it have something to do with the dearth of women even in semi-senior leadership? Hard to conclude anything else in a nation where girls have a hard enough time being born never mind influencing Communist Party priorities. South Korea fell again to 118th, putting Asia’s No. 4 economy behind Tunisia and Ethiopia. Even nations that pride themselves on doing better on gender lost ground. The Philippines is now 10th versus seventh last year. Singapore went from 55th to 65th, Vietnam from 65th to 69th and Thailand from 71st to 75th. There were some gains, of course. Indonesia, Southeast Asia’s biggest economy, improved to 84th from 88th, Malaysia to 104th from 106th, and Cambodia to 99th from 112th. Unfortunately, Asian backsliding is the more pervasive takeaway. Such terrible economics squanders at least $90 billion of output annually, the United Nations estimated in 2015. It was a conservative estimate back then. It looks even less realistic now given the level of gender-equality regression. Japan is Exhibit A. Nearly five years into Abenomics, Abe still hasn’t named a woman to a truly international Cabinet job — foreign affairs, finance or chief secretary. Indonesia, by contrast, has done just that. Its current finance minister is the globally respected Sri Mulyani Indrawati. Indonesia, it’s worth noting, has improved annually for several years now as Japan and China lost ground. Abe’s failure is one of political will. As Abe considers which reforms to prioritize following his Oct. 22 election win, galvanizing women is the lowest of low-hanging fruit. As Goldman Sachs famously predicted, gross domestic product would be 15 percent bigger if female labor participation matched that of men. Tokyo could offer tax incentives to companies that meet a certain ratio of female executives, those that eliminate gender-pay gaps and those that add more female boards seats. Transparency matters, too. Why not demand more gender data and create a ranking list that shames laggard companies? There’s an irony to Abe’s over-reliance on Bank of Japan liquidity. The central bank is racing ahead of Japan Inc. in cracking the glass ceiling. Across Japan, only 7 percent of senior management jobs are held by women. In little more than a year, at least five major BOJ branches have female chiefs for the first time. And at least 18 percent of senior career-track BOJ positions are now held by women. The next time Abe calls Governor Haruhiko Kuroda for more monetary firepower, the prime minister should ask him for womenomics pointers. It’s high time that Japan, and Asia generally, turned today’s embarrassing gender dynamics into an economic opportunity for tomorrow.